With the introduction of the new R9 robot control system, WITTMANN impressively demonstrates the potential which can be realised by the use of latest hardware and software technologies in the form of increased efficiency and operational safety. 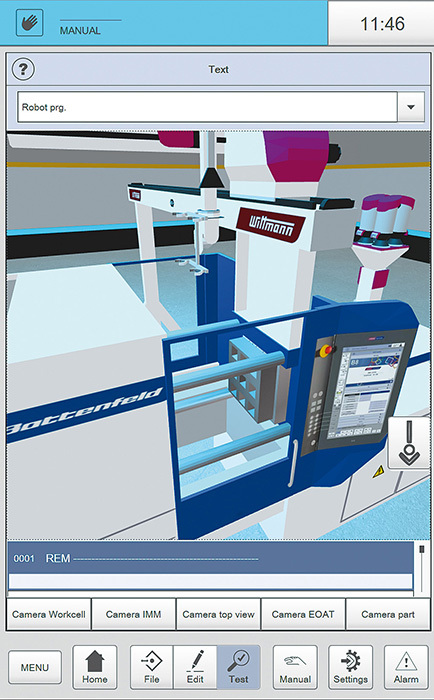 A significant functionality which has thus become possible is the digital robot twin, which is now available as standard with the R9 control system and enables virtual validation of the sequences to be carried out by the robot at any time – and consequently without any risk for the processing machine or the robot. 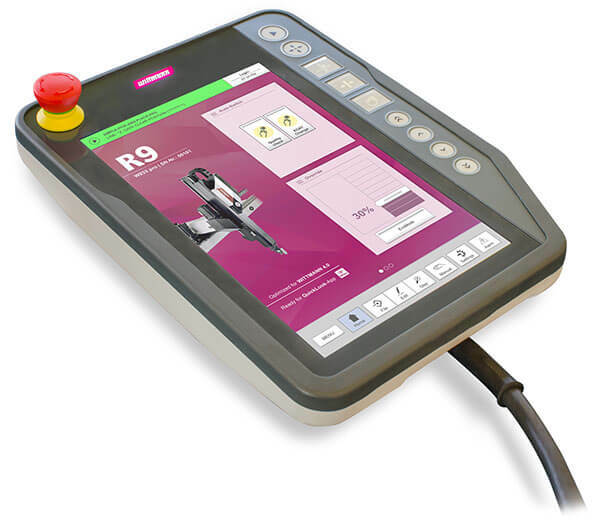 The R9 control system, already shown at the K 2016, offers an enlarged display screen of 10.1″ in portrait format (compared to 8.4″ on the manual input terminal of R8) and has a capacitive touch surface in line with the current tablet trend. This surface now also supports gesture commands (wiping for page change and zooming with two fingers), which makes the operation of the appliance even more intuitive. R9 is also equipped with several multi-core processors for improved performance through optimal division of tasks. Time- and safety-relevant processes can now be completely detached from the visualization level to ensure top-quality operational safety and fastest possible response to critical incidents. In consideration of these innovations, WITTMANN has developed some new approaches to provide even better support for machine operators. The new possibilities include visualisation of the programmed sequence. Based on its programming, the control system generates a virtual production cell, parts of whose visualisation can be zoomed with freely selectable perspectives, which can be altered at any time. In this way, a digital copy (twin) of the actual production cell and/or the robot is present in the control system. This twin has the same attributes and characteristics as the equipment existing in reality and thus enables simulation of the application-specific processes. R9 robot control with start screen. the screen displaying the digital twin of a working cell. As soon as the relevant parts of a robot program have been created, it is possible to enter the simulation mode via the test menu of the control system. To distinguish the virtual twin unmistakably from the real equipment, a luminous frame appears on the screen of the R9 TeachBox in this mode, and the virtual robot is shown in the form of a schematic image. This mode also enables simulation of the injection molding machine based on recorded key parameters. 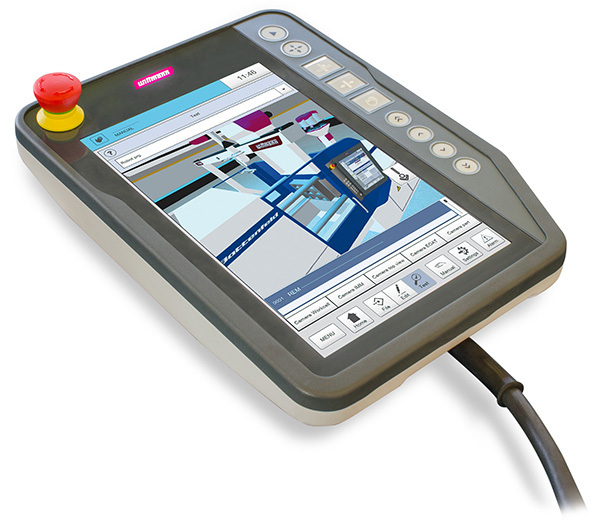 The simulation mode thus enables the operator to detect any serious faults in the robot program very quickly without having to take the risk involved in a real test run. The digital twin is available for the entire process in every operating mode, including “dry operation”, manual operation or step operation. In addition to using the digital twin on the R9 control system, it can also be started on a PC. If the relevant device definitions are available there, a simulation run can already be carried out before the program is entered into the robot, and possible sequencing errors are detected at an early stage. In such cases, the digital twin minimises the unproductive time which must be spent on machine setup in a production cell. For the logic sequence of the robot program has already been tested on the PC beforehand – only the real positions of the robot still need to be “taught” following data transfer. The R9 control system offers yet another safety feature which goes beyond using the digital twin. In manual operation and during dry cycles, the R9 control system activates its anti-collision control. The latter continuously monitors the power input of every single drive system. In the event of excessive deviations from the standard value – and consequently an acute danger of the robot colliding with other components inside the production cell – the drive systems are shut off immediately. “With the detached visualisation of the digital twin, we aim to achieve shorter setup times and ensure trouble-free operation by means of preventive action. We are very much looking forward to the pleasure of presenting all of this for the first time to our customers at the Fakuma 2017”, says Martin Stammhammer, International Sales Manager Robots and Automation Systems of the WITTMANN Group.